Doks is Jekyll theme created for project documentations. Doks is fully documented with an online documentation. 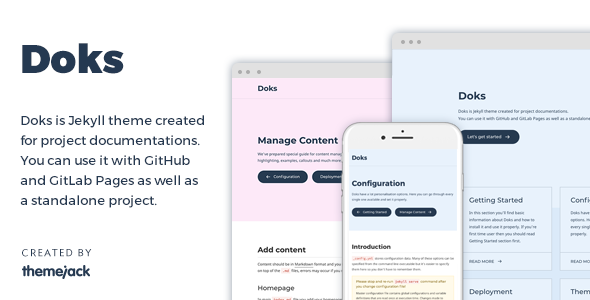 Doks is GitHub and GitLab Pages compatible and it’s ready to deploy in just a few moments. Choose between 5 color themes. Doks have icon pack built in. You can use this icons in some places such as social list in footer or buttons in homepage layout. Allow users to comment your pages via Disqus. Just add your Google Analytics Tracking ID and enable statistics and tracking for each of your pages. We built custom fixed page navigation. Apply theme updates in a second.